One of the costs of mooring a boat in the Puget Sound is the clean up when you haul it out. 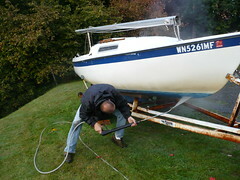 This past weekend I pulled 'Blue Wing' out of the water. I borrowed Tim's pressure washer, and spent an hour after work cleaning the scum off the bottom. This was the first year that I used a pressure washer. The growth came right off the part that had bottom paint. The sides were a different story. Well, it's clean enough to store for the winter.